The 70's were another good decade for the Treeing Walker Breed. The ACHA World Hunt was continuing to grow in size and importance. Of the 10 ACHA World Champions in th 70's the Treeing Walkers won 8. 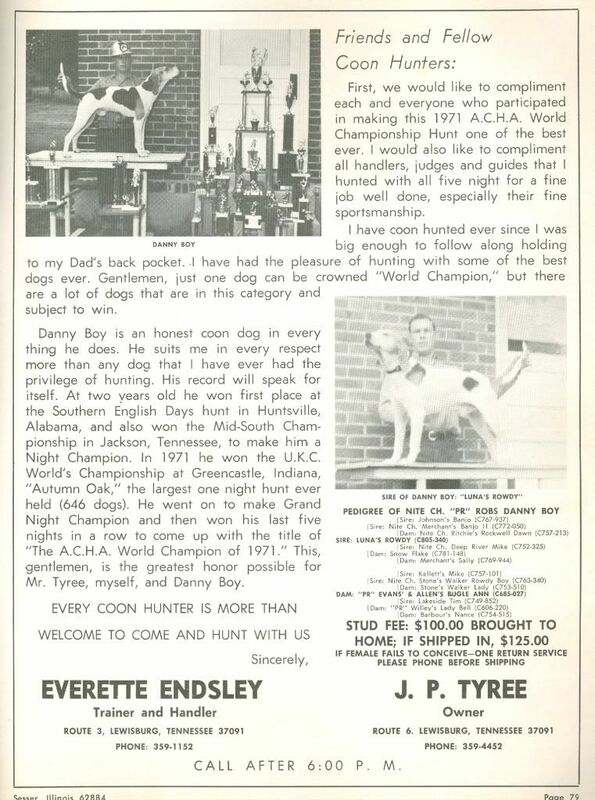 The United Kennel Club, UKC, decided to get involved in the World Hunt Business in the 70's. In 1960 the first Autmn Oaks was held. It was called AUTUMN OAK WORLD COONHOUND CHAMPIONSHIP. The Labor Day classic was billed a world championship by U.K.C. management. From the inaugural event through 1975, the World Championship designation remained a part of the Autumn Oak name. But the Autumn Oak World Coonhound Championship was not an elimination hunt. It was just a big registered hunt. 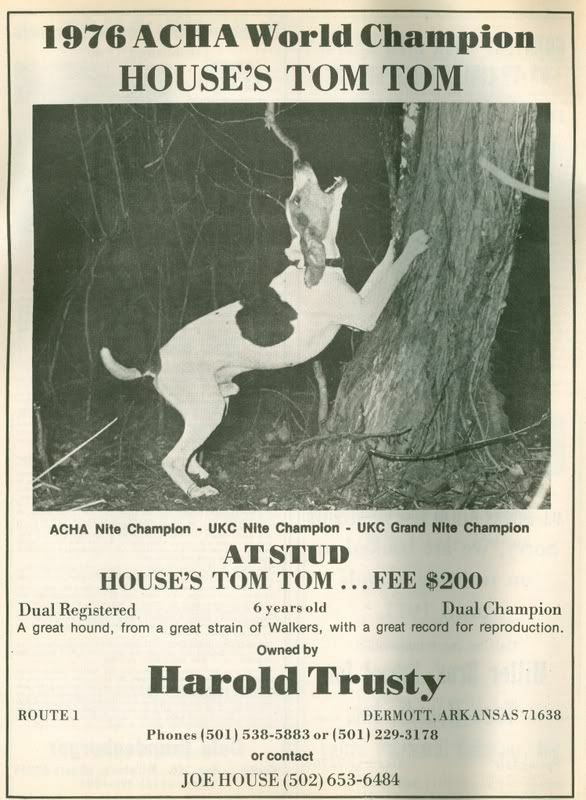 At times people who was the High Scoring Dog at Autumn Oak would advertise their dog as UKC World Champion but most didn't consider that as a true world hunt. 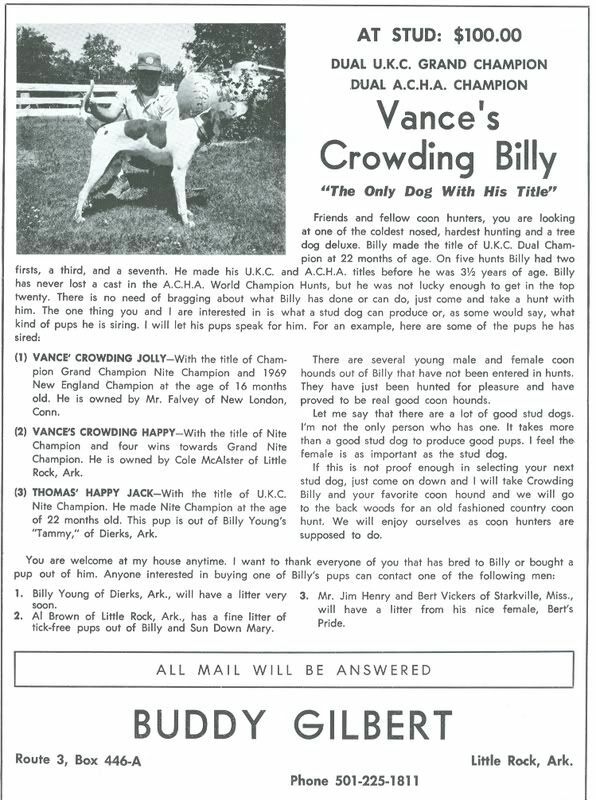 The thing that became a big deal in the 70's was to win the NATIONAL GRAND NITE CHAMPION title or the National Grand Nite Champion Of Breed. 3 years in a row SPRING CREEK ROCK won National Treeing Walker Grand Nite Champion and 2 of those years in a row Rock was NATIONAL GRAND NITE CHAMPION. After Fred Miller bought U.K.C. the registry dropped the World Championship designation and make the worl "OAK" plural, AUTUMN OAKS. In 1975 UKC started the Tournament of Champions. Their answer to the ACHA WORLD HUNT. Because of the name or the way it was run, the TOC wasn't an answer to the ACHA World Championship. 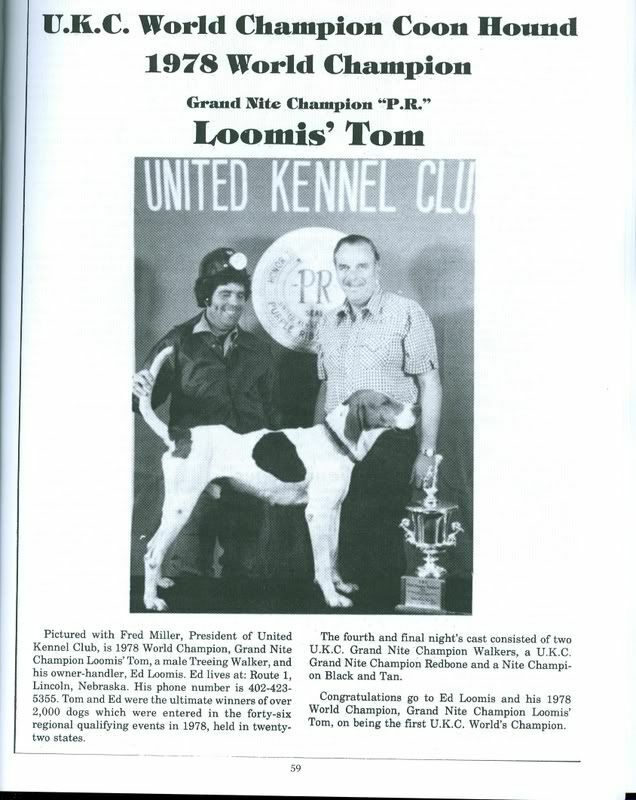 The first year the TOC was held a dog had to be a Nite Champion or Grand Nite Champion to enter a Regional Qualifying Event. Once you qualified at a RQE the dog could be entered in the TOC Four Night Finals. The first year at the finals there were 30 dogs at the finals. 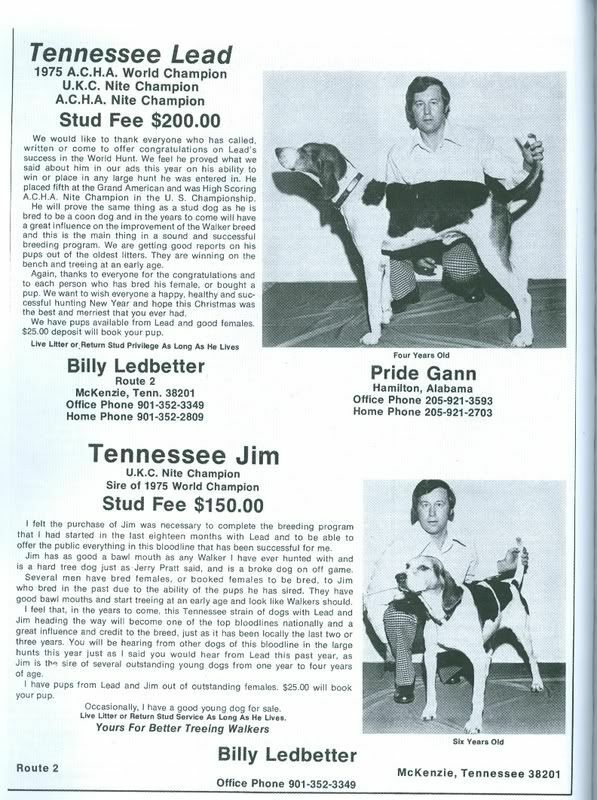 The second year of the TOC 1976 there were 19 dogs at the finals. The third year of the TOC 1977 there were 26 dogs at the finals. The 2nd and 3rd years of the TOC the hunts were open to untitled registered dogs. This helped increase the entries at the RQE's but the turnout at the finals was disappointing. Especially compared to what the ACHA World Hunt was drawing. Fred Miller decided to drop the TOURNAMENT OF CHAMPIONS name and change the name to U.K.C. WORLD CHAMPION with the title of World Champion being put on that dogs papers. 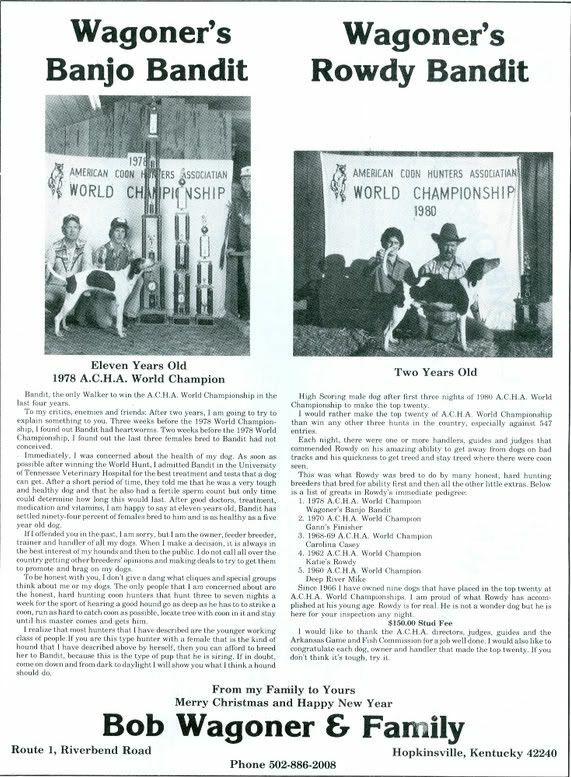 The next year 1978 the first UKC World Hunt was held. At the finals were 88 dogs, still not comparing to the ACHA numbers but a big improvement from the TOC. The first UKC WORLD CHAMPION was a Treeing Walker. So starts the beginning of more World Hunts then just what had been considered for so long THE WORLD HUNT by ACHA. The 70's started off with another son of Finley River Chief winning the World Championship. Creating more interest in Finley River Chief and the Finley River Strain. LUNA'S ROWDY The sire of Danny Boy. After placing in the Top 20 of the 1970 and 1971 World Hunt Billy finally brought home the big prize in 1972. 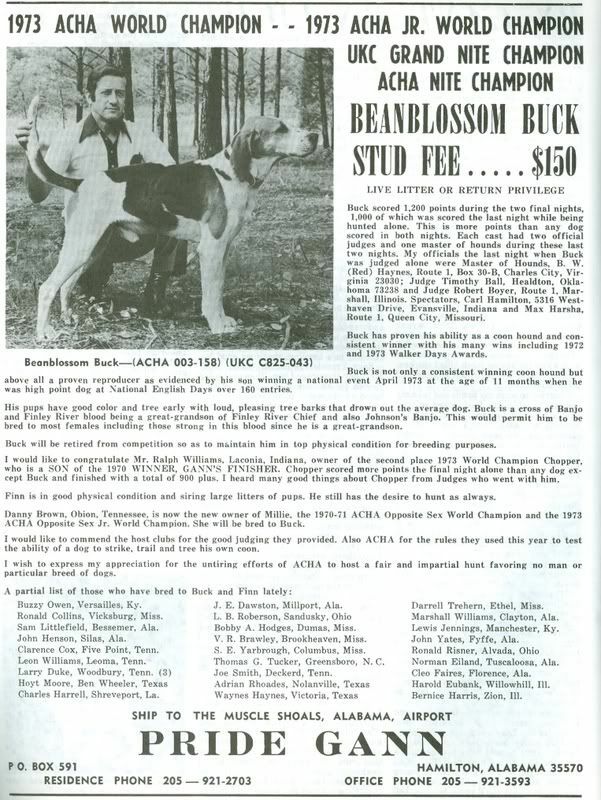 After winning the World Hunt in 1970 with Finisher, Pride Gann does it again with Buck. Beanblossom Buck was out of Carsten's Finley River Buck who was a grandson of Finley River Chief, creating yet more buzz about the Finley River Strain. 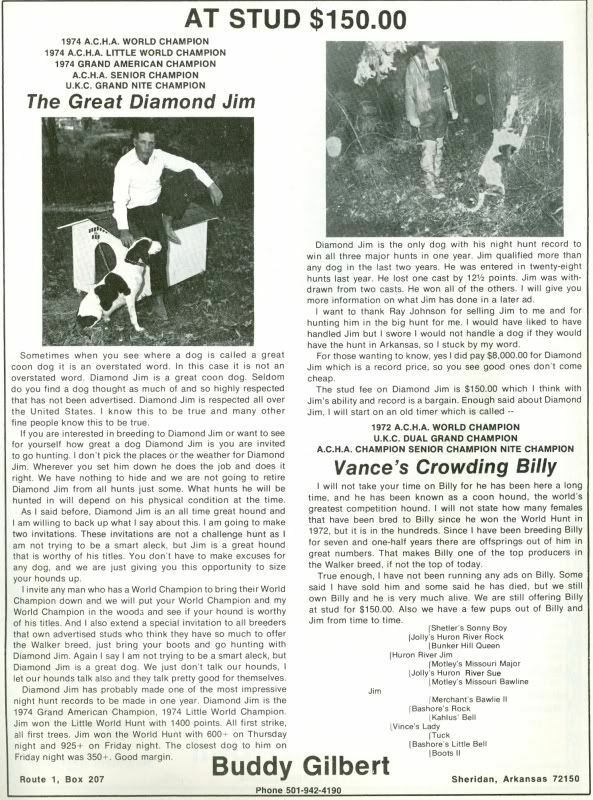 After winning the World Hunt in 1972 with Crowding Billy, Buddy Gilbert does it again with Diamond Jim. NITE CHAMPION TENNESSEE JIM The sire of Lead. 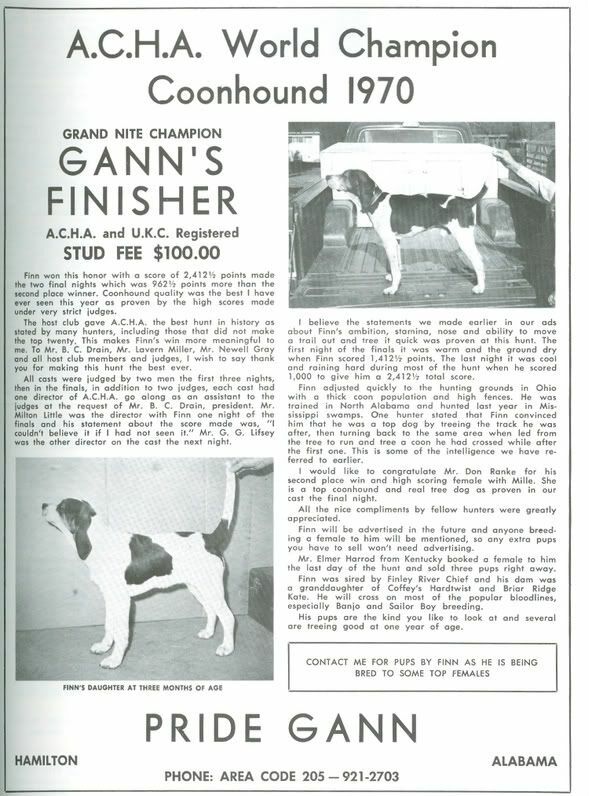 The First UKC World Champion.